Dale Rollings, former owner of The Yellow Farm House Winery (and retired attorney) has published his first historical fiction book, “The Trunk”. Set in the South St. Louis in the years leading up to WWII, the book captures the conflicting emotions that many German-Americans, often only one generation removed from immigration, struggled with during that era. Rollings said he started the book years ago. At the time, he traveled extensively for his job. Rather than hang out in a bar in the evenings, he’d stay in his hotel room and write. When Dale retired from practicing law, he changed careers and became a winemaker, planting vineyards and opening “Yellow Farm House Winery” in Defiance. After 15 years in the wine business, Dale decided to “retire again,” and that’s when he dusted off “The Trunk” and finished it. It seems that before and during World War II there were substantial numbers of supporters of German Political philosophy and the rising Third Reich. Support for America’s position backing Britain was not universal. Support for Nazism in America seems to have had its roots in the Depression, but there were many complex causes for its emergence. It’s easy to throw it off on anti-Semitism, but that is little too simplistic an explanation. Anti-Semitism was certainly a feature of Nazism, even in this country, but it is not the whole story. And then there was Eugenics, the now debunked theory that by selectively breeding (of animals or humans) we could create a “master race” of purer, more ethnically cleansed, stronger, disease-resistant animals and humans. It was an easy jump from the study of Eugenics to a philosophy of an Aryan “Master Race” so advocated by the Nazis. Finally, just plain old Nationalism contributed to the tendency toward Nazi support. In the early part of the Twentieth Century, America absorbed huge influxes of German immigrants. In the Twenties and Thirties, over 500,000 Germans came to America seeking jobs and a new life. Leaving cultures, history, traits, and friends behind in the Old Country was not so easy, and maintaining a connection to the Old Country was both easy and comforting. Lots of German immigrants settled in South St. Louis. It’s no wonder that German clubs of every description sprang up. Some openly professed that their purpose was to keep the German traditions alive in America and to see that the German Heritage, transplanted in America, was not extinguished. It’s easy to see how some were more radical than others and the attraction of Nazism could gain a foothold among the transplanted German Community. As Hugo and Frieda build a relationship, then a family and a business, they are pulled and tugged by the political and social forces of the Thirties and Forties. By constant contact with radical Nazi sympathizers, financial pressures and a new family, they slowly slide over to the other side. In the end, they are inextricably involved in a horrible Nazi scheme that would kill thousands of Americans and destroy a big portion of their home city. Interestingly, some events intervened in the growing tendency for Nazi sympathy in America. The first was Pearl Harbor and the Declaration of War by Nazi Germany all within a week. Most of us today do not realize how large a shock these events were to the American psyche. One bard said it was the greatest week to ever “blow fence-sitters off the fence!” Many Americans, who were neutral, or ambivalent about America’s participation in the lead-up to World War II, came down hard when we were attacked. The second was the discovery by Allied Forces of the horrible atrocities being perpetrated in the Nazi camps in Central and Eastern Europe. Americans were sickened by the Nazi’s treatment of Jews, Gypsies, disabled and infirm. All but the most die-hard sympathizers in America lost their zeal for the Nazi philosophy when the atrocities were uncovered. By the end of World War II, most had melded into the woodwork. 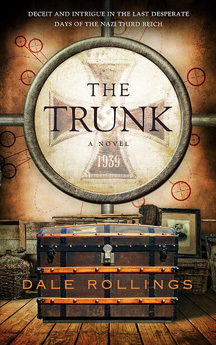 In “The Trunk”, readers will follow along as Hugo and Frieda’s son, Don, and his wife Connie, discover the unsettling truth that his parents, whom he had always thought of as loving, attentive, hard-working people of high moral character, were functioning Nazi spies! How could that be? How and why did they become entwined in a political philosophy that was so evil? Follow along as Don and Connie piece the clues together, grapple with their own conflicted emotions, and uncover the one small glitch that unraveled a heinous plot that would have changed the course of history. “The Trunk” is available in electronic form at Amazon, Kindle, Nook, and KOBO. The printed edition will be available in early May at www.dalerollings.net, and at Amazon, Barnes and Noble, and other retail outlets. This is not Dale Rollings’ only book in print. He self-published “Exit Laughing” in 1999 – a handbook for people looking to sell their business. 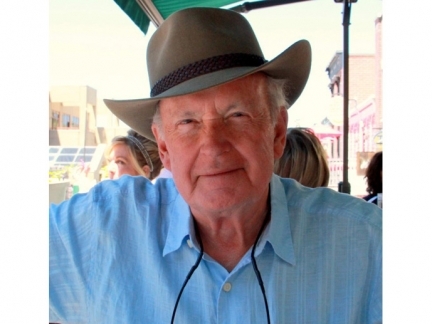 He’s also working on a second novel – another historical fiction – set in France, post WWII. Look for it to be finished later this year. For more information, visit www.dalerollings.net.